Contains 6 Green Sensors for Drivers, Fairways, Hybrids, Irons, Wedges and 1 Black Sensor for Putters. 1 New: Never been used. We Have The Most Extensive Inventory of Headcovers In The World. Swingbyte 2 Golf Swing Analyzer Golf Training Device White. Condition is Used. Shipped with USPS First Class Package. arccos golf 360 sensors. Condition is Used. Shipped with USPS First Class Package. 6 regular club sensors (driver, irons, etc.) and 1 putter sensor. Used condition but still works well. Any questions please ask. 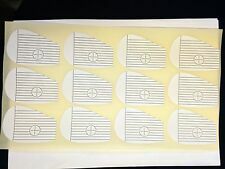 Golf Impact Tape Recorder Training Aids, 20 labels of Iron. Long Shot Impact Recording Labels are the most used teaching and club fitting aid on the market. All these labels will work for lefties too! Used only twice!!! Upgraded to sc300 Voice Caddie SC200 Swing Caddie 2 Portable Launch Monitor - Blue. Condition is Used. Shipped with USPS Priority Mail. Arccos 360 Sensors. 2 Putter Sensors (One round and One Tear shaped). Genuine spare/ replacement ZEPP 2 Golf & Tennis charger charges from USB port or plug. Includes Swing Pad, Software, USB Cable, Foam Practice balls, Adjustable Rubber tees, and Start Guide. (drivers, fairway woods, hybrids, single irons, wedges, putters. ). 100% Brand new and high quality Sponge golf training soft ball Soft, light-weight and flexible Very attractive and bright color Great for approach shot practice Material: EVA Diameter: 38mm Color: Multi-colored Includes:50 X Indoor Practice Sponge Foam Rainbow Balls MPN Does not apply Brand Unbranded UPC 190268162708 EAN 190268162708 ISBN 190268162708 UPC 190268162708 EAN 190268162708 ISBN 190268162708. 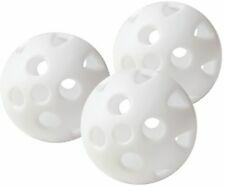 Birdie Ball Practice Golf 12 Pack Open Box 40 Yards. Shipped with USPS First Class Package. One was used once, the 11 others are untouched. Practice Your Swing In Seconds With This Superb Value-For-Money Roll-Up Golf Hitting Mat. This is your secret weapon to becoming the best player at your golf course! Grass Thickness: 13mm artificial turf convincingly replicates the look, feel, and touch of an actual golf course. (revised 06-29-2015). Long Shot Impact Recording Labels are the most used teaching and club fitting aid on the market. All these labels will work for lefties too! At least 6 to 8 readings per label. A golf swing weight trainer and swing guide combo. 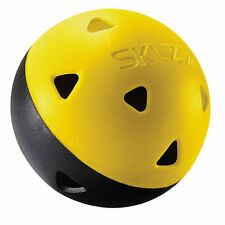 SKLZ IMPACT SMASH BAG GOLF TRAINING AID IMPROVES MUSCLE STRENGTH & CONTROL !!!!! IMPACT SMASH BAG. 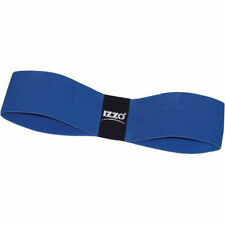 IMPROVES MUSCLE STRENGTH. GOLF TRAINING AID. All goods remain the property of HOTGOLF LTD until paid for in full. This fee will depend on the size of the order and will be quoted should you wish to cancel the order. Impact Ball golf training aid - Golf's most effective training aid! Best seller! There is a base on the pin so the ball rests on it when you hole the putt. 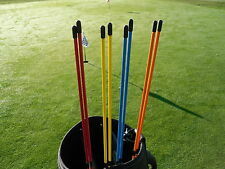 A set of 4 plastic putting green flag and hole set. Each flag is a different colour. JLGOLF LTD : golf accessories at great prices! The secret of Country Club Elite® is the combination of these three components resulting in the best golf mat available anywhere. When CCE Real Feel is struck during a golf-shot the fibers will absorb and dissipate the blow as if taking a divot. PELZ GOLF PUTING TUTOR. Pelz putting tutor (used and endorsed by Phil mickelson) will help you improve your green-reading skills as you simultaneously learn to make consistently better putting strokes. Knotless, UV Treated. High Impact Golf Netting. 15 feet by 18 feet. There is a base on the pin so the ball rests on it when you hole the putt. They are numbered 1, 2 and 3. JLGOLF LTD : golf accessories at great prices! For the Check-Go Original and Check-Go PRO Sweet Spot Finders. PRO PUTT 3 METRE GOLF PRACTICE PUTTING MAT +FREE PUTTING MIRROR !!!!!!!!!!!!!!!! The Pro Putt putting matt features specific markings allowing you to practice and repeat. 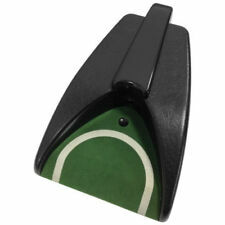 This premium quality putting matt is provided with a FREE practice putting mirror which allows. All goods remain the property of HOTGOLF LTD until paid for in full. 10ft x 10ft Impact Panel For All Golf Cages - Lower Your Handicap In Perfect Safety. 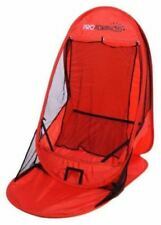 Hangseasily from any 10ft x 10ft x 10ft golf cage. Size: 10ft x 10ft Heavy Duty impact panel. PuttOUT Putting Mirror & Training Gates. Made with a three-layer design, the PuttOUT Putting Mirror has a glossy, anti-scratch surface printed with simple markings and guidelines. First PuttOUT product designed to be used both indoors and outdoors. Covers are durable/hardwaring and waterproof, they are 39cm long so they go all the way into the divider of your golf bag. Swing Caddie - SC 200 - Portable Golf Launch Monitor - Neuheit ! Mit der neuesten Doppler-Radar-Technologie und der Kalibrierung von Atmosphärendrucksensoren bietet der SC200 kompromisslose Präzision. Durch die Integration der Sprachausgabe der Entfernung bietet der SC200 höchsten Benutzerkomfort. The Tour Striker Smart Ball will help you understand HOW the arms and body work during an effective golf swing. Few people put in quality practice working on the sequence of arms and body. TOUR STRIKER SMART BALL / GOLF TRAINING AID / AS USED ON TOUR BY JUSTIN ROSE. Most physically demanding Orange Whip. Perfect for getting in shape for the upcoming season. NEW in Original Plastic - Never Used. High quality Golf putting Green surface designed to stay smooth. Includes Swing Pad, Software, USB Cable, Foam Practice balls, Adjustable Rubber tees, and Start Guide. All single pieces (drivers, fairway woods, hybrids, single irons, wedges, putters. ). It's like having a scope for your putter. We do it without any expensive lasers, batteries or lengthy assembly processes. It truly is the easiest way to learn how to make more putts! - Works for both right and left handed players. 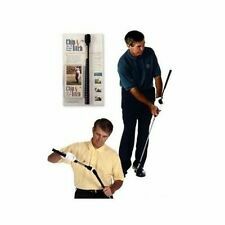 Jim Sowerwine's Inside Approach Golf Swing System VHS NEW - FREE SHIPPING !! Here is a NEW - NEVER USED ( Open Box ) of Jim Sowerwine's Inside Approach Golf Swing System. Included inside is the Inside Approach, Custom Carry Bag, Instructional Manual, Instructional VHS video featuring Jack Nicklaus and inventor Jim Sowerwine.